Dorothy Simonelli held the speech she read Monday. 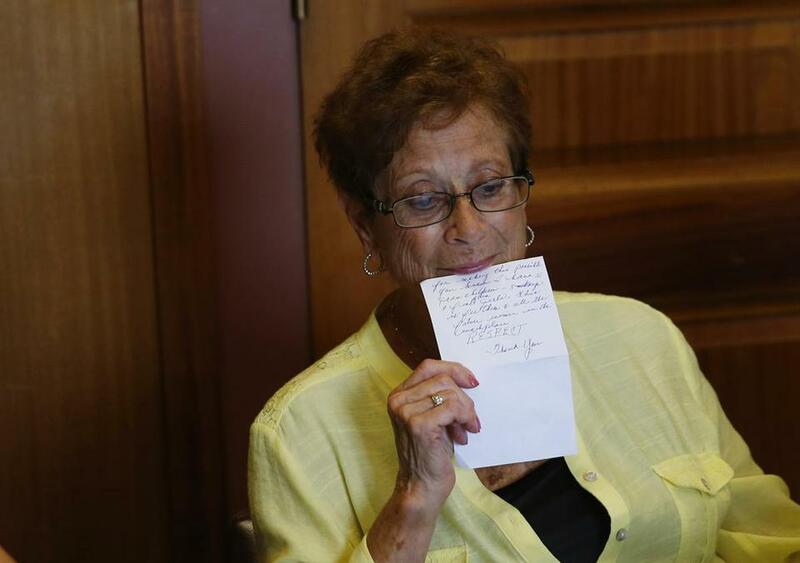 At first, Dorothy Simonelli didn’t want to come, or see her name or photo in the newspaper. The wounds still stung two decades after losing a bitter case that was the first legal test of the state’s equal pay law. She was among 41 lunch ladies who sued the Everett Public Schools alleging their work was comparable to the male custodians yet the women were paid only half as much. Simonelli wasn’t ready to revisit the past. Like many of her former colleagues, she lost her job. She never worked again. Many of the other workers, including her sister, have since passed away. “I want to forget the whole thing,” Simonelli, 83, told me. Actually, it’s time to remember — and applaud — her role. To recall the courage of a group of cafeteria workers in 1989 who dared to demand to be paid fairly and in doing so inspired legislators to enact a new Massachusetts law to close the gender wage gap. I made it my goal to make sure Simonelli was there Monday at the State House, standing right beside Governor Charlie Baker as he signed the bill into law. She had to do it for herself, and for her co-workers, especially lead plaintiff Marilyn Jancsy , who never lived to see justice served. But this is why I persisted: Simonelli and her co-workers are our Lilly Ledbetters. 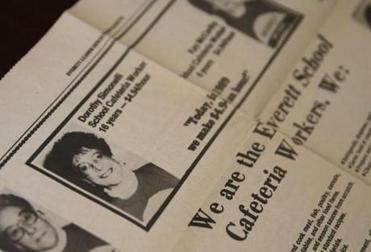 A picture of Dorothy Simonelli from an advertisement that ran in the Everett Leader Herald on March 3, 1989. Ledbetter is the Alabama woman whose gender-based wage discrimination suit went all the way to the Supreme Court. She lost on a technicality that prompted Congress to create the federal fair pay act that bears her name. President Obama signed it into law in January 2009, the first piece of legislation in his administration. Like Ledbetter, our lunch ladies initially won their case with a Middlesex Superior Court judge awarding them close to $1 million in back wages. But they lost on appeal in 1998, a case that spanned nine years and went twice to the Supreme Judicial Court. In writing the dissenting opinion, justiceMargaret Marshall criticized her colleagues for not wanting to change society. It was a 4-3 decision that broke down along gender and racial lines. “Today, the court withdraws from the difficult challenge of analyzing comparable work and forsakes the quest for gender equity in workplace compensation,” she wrote. Back in the 1980s, the lunch ladies of the Everett public schools were newly unionized by Local 26, which represents hotel and food workers. The group of women sought a raise, and when they didn’t get one, they sued under the state’s equal pay law. The women figured out that the school system’s male custodians were paid roughly twice as much. The lunch ladies argued that they did “comparable work” so they were entitled to the same size paycheck. During the trial, Jancsy testified that she cleaned and scrubbed, and even lifted heavy objects such as 10-pound logs of frozen hamburger and 40-pound cases of canned tomatoes. When the SJC ruling came down, Alice Wolf, then the state representative from Cambridge, and Pat Jehlen, then the state representative from Somerville, read about the plight of the lunch ladies and how the state law had failed them. “That hit me like a lead balloon,” recalled Wolf. In December 1998, Wolf and Jehlen filed a bill to clarify the definition of comparable work. Enlisted to craft the legislation was Lee Goldstein, the lunch ladies’ lawyer. 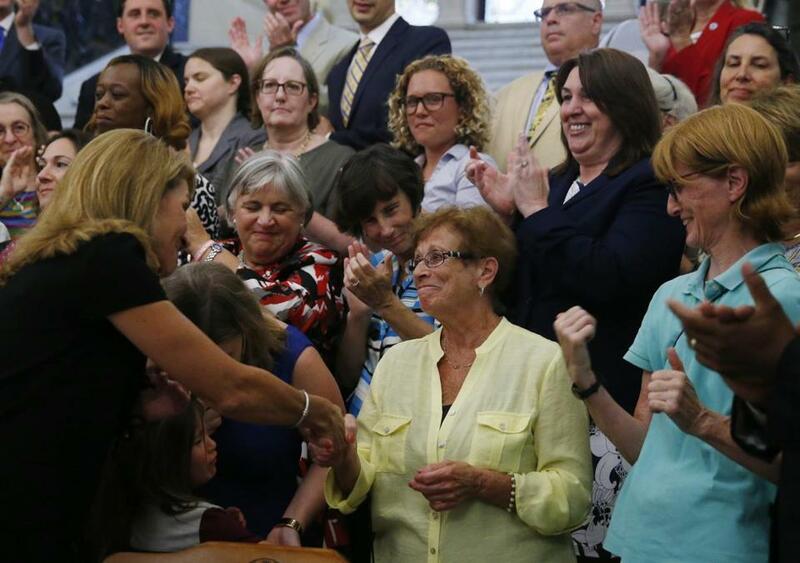 Lieutenant Governor Karyn Polito shook hands with Dorothy Simonelli Monday at the State House. Jehlen co-sponsored the bill every year, even after she became a state senator. After Wolf retired from the Legislature, Representative Ellen Story, an Amherst Democrat, deepened her involvement. In 2014, Story decided to roll up similar fair pay bills, including one defining comparable work, into one comprehensive piece of legislation. It is that bill — which Senator Karen Spilka also co-sponsored — that finally made it through both chambers unanimously, with the help of Attorney General Maura Healey and with deputy House leader Patricia Haddad working with business groups to win their support. The legislation is groundbreaking, making Massachusetts perhaps the first state to prohibit employers from seeking salary history upfront as well as giving employers legal incentives to conduct salary reviews to detect disparities. Despite the current law, women in Massachusetts on average make only 82 cents for every dollar a man earns. A couple of weeks ago, Barbara Rice, a former Local 26 representative who worked with the women, reached out to me after I wrote a column about the pay equity bill. She thanked me for mentioning the lunch ladies of Everett. I had to ask: Did she keep in touch with any of them? Rice provided me with a spreadsheet of names. Simonelli was the first one I called last week, and as it turns out the only one I would reach. Simonelli knew about the legislation, but was reluctant to get back in the spotlight. She asked that I didn’t use her full name or be photographed. I explained that she and her co-workers are changing history. “I never thought that would happen,” she said. With the governor due to sign the bill on Monday at the foot of the State House’s grand staircase, Rice wanted Simonelli there and so did Jehlen. Rice made her a pitch over the weekend — at least Simonelli should meet with the senator to thank her for carrying the legislation. Rice just about gave up until she heard from Simonelli late Sunday night. Her family had persuaded her to go, at least do it for her grandchildren. In front of dozens of Beacon Hill leaders including House Speaker Bob DeLeo and Senate President Stan Rosenberg, Baker signed the pay equity bill into law. The governor then turned to Simonelli, who watched over his shoulder, and handed her his pen. Later that evening, Simonelli delivered remarks to a group of women who gathered to toast the victory.